Where did the idea come from, and how or where do you see the place of Japanese sword guards outside the sword community ? I’ve just realized that it does seem recently that I’m focusing the work for people outside the sword community, but it really is just for this show. In fact, the first people to see these pieces are my local Token Kai, my iaido club and my teacher, Ford Hallam – these pieces needed to “work” as tsuba in every definition and the best feedback for that are people familiar with tsuba. That said, I’ve always found it challenging to concisely describe what it is that I do and why to audiences outside of the JSA and collecting communities. There are so many supportive people out there in the world that part of my work has become sharing and explaining ideas in order to bring those supporters “along for the ride”. If they can understand what I’m doing and why, then I’m doing the community at large a service by sharing knowledge and application. The best way to do so, I’ve found, is to position the work as an artist would. By blurring cultural lines and drawing parallels between Japanese/Chinese and western concepts of art, I hope that people will start to see these little pieces of crafted metal in the same way one might look at a painting or a photograph. Hence the concept of a “gallery” show – basically, “here’s what I do, and here it is in a format that is familiar and comfortable.” The trade-offs, of course, are that the viewer can’t get as close as when actually handling the piece, and the back is not on view (which is another reason I opted for pierced designs for this show). Japanese swords and their fittings utilize a very particular aesthetic, but as with all Japanese art, with a bit of study it isn’t difficult to understand that aesthetic. The real challenge (for me, anyways) is understanding the cultural significance of the themes. Once someone has even a bit of that knowledge, coupled with an appreciation of the process of the making of the piece, they are at a good starting point for looking at this kind of work. I think that there will always be layers of meaning in Japanese art – someone unfamiliar may see tadpoles and water, but someone who has studied sword fittings will see tadpoles and water rendered in a certain way. It works both ways, and I’m interested in the conversations that happen with everyone that looks at my work. Is there any particular reason you have chosen to go for designs of the Akasaka school ? Two reasons. Firstly, I very much enjoy examining the technique of intricately pierced designs, and the Akasaka school does not disappoint in this regard. 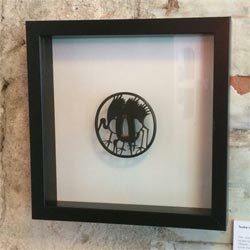 Secondly, the awareness of composition and design that is apparent in these works is very appealing – I find that the look of these tsuba is very reminiscent of Japanese painting. That said, I couldn’t resist throwing a dash of Higo and others into the mix. Wouldn’t designs inspired on more common, modern day and age scenes or characters make the art more accessable for people outside of the sword community ? That’s a question that I’ve asked myself over and over again. The motifs on tosogu are a look at the mindset and culture of the people who wore them and the artists who made them. Since we don’t wear swords in our daily lives, maybe a more relevant application of modern themes would be in jewellery or watches. Perhaps practitioners are the exception, but I wonder how it would look in the dojo to have a practice blade fitted out with “modern” themes. I immediately think of some of the sword “themes” you often see on eBay. I think that it is a very delicate balance to strike – there are certainly opportunities for modern depictions of elements or landscapes in the natural world. Tosogu offer a unique and particular canvas for this, and it is possible to do this tastefully within the traditional compositional structure. But to render distinctly modern scenes or characters – let’s just say I’d prefer to see some sketches before actual pieces. It may seem odd to say this, but even though I’m very interested in showing people the uniqueness of this kind of art, I’m also very protective of the “Japanese-ness” of it. I’m a student that someday (hopefully) will be a custodian – to impose my own sense of “modern-ness” at this point in my career would almost be dishonest. However, there is something in drawing inspiration from the world around me that appeals to my development as an artist. I have a friend who paints wonderful abstract cityscapes, and I often wonder how this kind of abstraction would look on a tsuba. It comes down to how an artist’s vision manifests itself within their experience and style they’ve developed. Can you give a rough idea of how much work goes into making one of these pieces and which ‘phases’ a piece is going through in order to be completed ? Hah! Good question – one of these days I’ll have to keep a time log on a project so I can actually answer it properly. As a guess, these are easily 50-75 hours on each, that includes the entire process from initial design straight through to patination and fitting the custom inserts to the storage boxes. There’s a significant amount of overlap as I jumped around from piece to piece quite a bit. Over the last 5 months that this project has been happening, there’s also been a bit of process photography, web work, writing and research that affects narrowing down an actual number. To answer your question about phases, I’ll give a rough outline of the process for the Pine Tree tsuba. Firstly the design was transferred to the metal and pierced out, then rim was shaped with chisels and files. The inside walls were refined by filing, and the overall shape of the pierced design was tweaked at the same time. At this point the piece goes into the pitch bowl for carving and texturing, then removed for a bit more filing, repeat. All the while I’m referring back to drawings and photographs and tweaking my own design to reflect what I think is the best way to approach the piece, as it’s constantly evolving. When I’m happy with the final look of the carving and the metal, I’ll do some extensive polishing with abrasives and a horse hair brush to “soften” the overall piece. It is then ready for the mei and the patination process, and finally a thin wax coating. What do you hope people outside the sword community will see or find when watching this form of art ? I sincerely hope that people will appreciate the narratives that are present in such concentrated, miniature work – hence the show title Stories in Steel. I hope that people will find opportunities to stop and refocus when looking at the work. These tsuba are so delicate and there is so much to see in the working of the metal that you really do need to be “present” in that moment to see it all. I’ve watched people at the show stop what they were doing to get right in close to the piece so they can examine it, and then they’re there for several minutes doing so. Then when I tell them it’s all done by hand , they go back and look some more. It reflects how I try to see the world, it’s all in the details. Once one can appreciate those, the world regains a bit of that visceral connectivity that’s so essential. Which piece is your favorite and why 🙂 ? It’s a close tie between the “Four Seasons” and “Pine Trees” tsubas. The opportunities for pushing the motif further than typical Akasaka work were too irresistible on the “Four Seasons” piece and it turned out a lot better than I had envisioned. 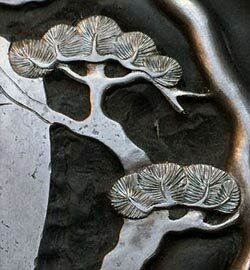 The “Pine Trees” tsuba, on the other hand, is the initial result of research I’ve been doing into the depiction of pine trees/needles in Japanese art. I’m pleased with the entire collection, but these two are very special to me. What will happen with these pieces when the exhibition is over ? They’re all for sale, so I’m hoping people will buy them! The tadpole tsuba will be packed up and sent to its new owner, and the others will go into their boxes to await the same outcome. Or you can check more of his work over here.